I almost forgot about blogging today. I am so tired and feel like I have a half million things to do and they all need to be done now. I know that isn’t reality…. I did find what I thought was a really cool widget on the Mac dashboard. It is a small translation tool. I like to use Japanese patterns and to shop for them. I thought it would be nice to be able to translate at least the titles. 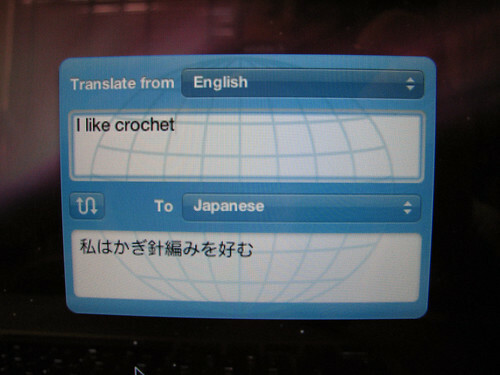 I posted to the Japanese Knitting forum on Ravelry about the widget thinking others may have used it, etc. The only reply I got was thanks for reminder so she could delete it. I am not sure how to take that. Oh well. Whatever. Here is a photo taken of the screen. I wish I would have chosen something a little more clever to translate. This entry was posted on Monday, December 29th, 2008 at 3:00 am and is filed under Life and Tools. Tagged: Life. You can feed this entry. You can leave a response, or trackback from your own site.